I love pasta. If I go to a restaurant, I can't help but order something pasta related. I really want to branch out but oh my there are just too many pasta dishes to get them all in at the rare times we eat out. So I make pasta at home. They are nothing like the ones at the restaurant. I'm disappointed in me. I need the secrets! That is not the only reason I make pasta at home. I'm a mother. I used to love cooking but now I just have to do it and many times without the love part in my brain. And it's my go to meal! It's easy and you don't have to spend hours doing it! Pasta is also healthy because you have so many ways of making it and the options to include veggies or different kinds of meat etc. 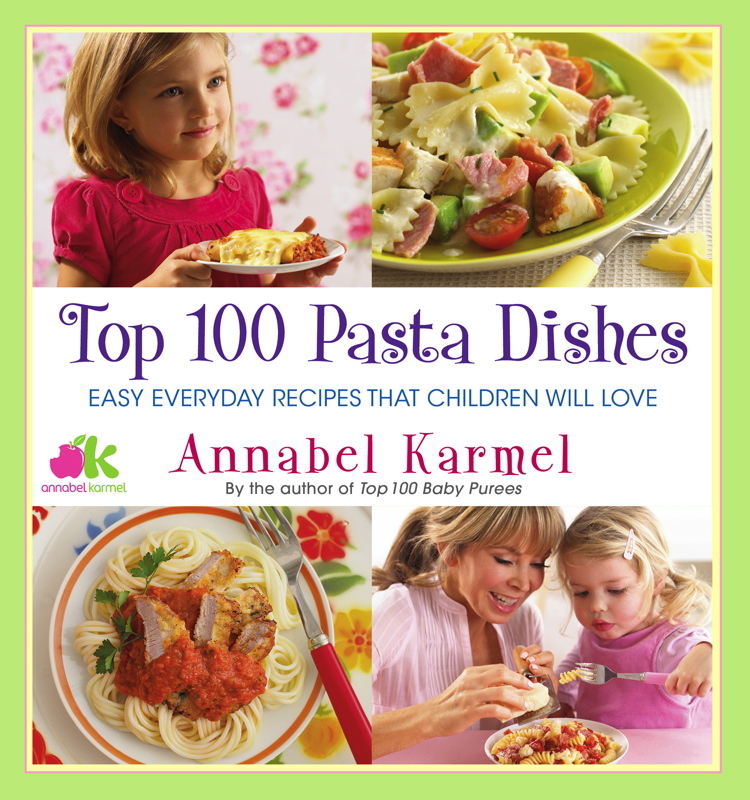 I received this cute book titled: Top 100 Pasta Dishes - Easy every day recipes that children will love by Annabel karmel and I gotta say that I'm in love! My first thought was: YES! This is the perfect time to get my kids cooking with me more often. I want them to grow up learning to cook for many different reasons. The contents covers sections for Baby, Toddler, Poultry and Pasta, Meaty Menus, Favorite Fish and Yummy Veggies. I love Veggie pastas and seafood pastas! I'm realizing that my kitchen needs to have some pesto!! I cannot wait to get this gem on my shelf. I didn't have all my ingredients so the kids and I choose the Spaghetti bolognese with pesto. And we had to make do with our pantry but next time we'll have our real ingredients for the dish. Pasta is a safe and easy solid food to begin feeding babies, and offers a great backdrop for introducing toddlers to new meats and vegetables. But best of all - parents will actually want to eat these recipes too! With Annabel's help, there's no longer a need to make separate dinners for you and the kids. Feeding your fussy eaters: Even the fussiest of eaters absolutley love pasta. Concealing vegetables: With Annabel’s colorful and tasty dishes, kids won’t even know they are eating “yucky” vegetables. One family, One Meal: Mom, Dad, baby and teen can all eat and enjoy the same meal. No last-minute mac and cheese or take-out necessary. Easy recipes for busy nights: Flip through the book on school nights and find a 30 minute meal at your finger tips. Save money: With ingredients like bowtie pasta, sweet potato and brown suagar, these recipes will not break the bank. In addition to all of these great practical uses, this book is seriously adorable and would make an awesome gift! Annabel Karmel is the mother of three children, a bestselling author of books on nutrition and cooking for babies and toddlers, and a familiar face on British television. Annabel travels frequently to the United States, where her books on feeding babies and young children are very popular. She has appeared on many TV programs, including the Today show and The Early Show. Please visit her website at www.annabelkarmel.com. I received this book for this review. See my disclosure. Both of my kids love pasta. I need to get this book because we are tired of the same things all the time. I'd love some more pasta dish ideas too, and you know I love the veggie dishes. I'll check this out in the store. Thanks! We love pasta! This does look like a cute book.